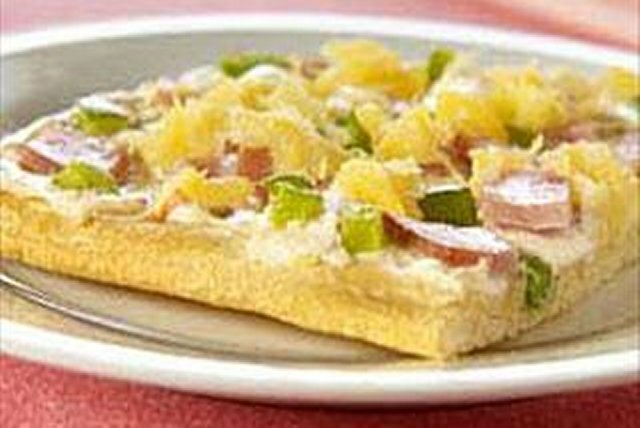 Canadian bacon and crushed pineapple top a layer of cream cheese on crescent dinner roll dough to make this simple and delicious pizza. Heat oven to 375°F. Unroll dough onto greased baking sheet; press into 12x9-inch rectangle, firmly pressing perforations together to seal. Bake 10 min. Spread with cream cheese; top with remaining ingredients. Bake 10 min. or until crust is golden brown. For added color, use 1/4 cup each chopped green and red peppers. Prepare using PHILADELPHIA 1/3 Less Fat than Cream Cheese with Chive & Onion. Pour pineapple into a fine mesh strainer held over a small bowl. Press the pineapple with back of spoon to remove most of the liquid. Refrigerate the liquid for use in making fruit smoothies or another use.